Enjoy the beauty of the Ionian Sea with Jeanneau SunOdyssey 35, our yacht. The yacht is equipped with gps, sonar, dromometer, anemometer and autopilot. See full specifications. our experience we recommend the following routes. 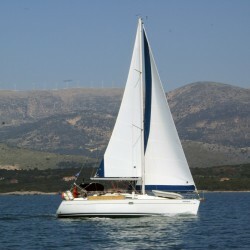 Now we offer daily cruises at low cost to discover the beauty of sailing. The world is yours from the deck of a yacht. -Coastline not accessible from land (e.g. White Rocks, Platia Ammos). -Beaches known for the appearance of Caretta-Caretta. •	Flexibility to the program is also well accepted. •	Tours are adjusted to weather conditions. Payment and other services under agreement. Prices refer to rentals per week. Port Fees only in Argostoli port, Dinghy and outboard engine. We had a day trip in July 2015. The boat is very nice. It has been well maintained, and Captain Dionysis did a superb job. I am also blown away by the beautiful beaches and scenery of Kefalonia. We had a fantastic time. The Yacht was in excellent condition and it was very easy to handle. We really enjoyed ourselves, hassle free. Even when we ran out of water we called Dionysis and he informed us about the second water tank, so we had fresh water again in no time! We had a week trip around Kefalonia and Zante. Definitely recommended. We are always at your disposal for any questions or concerns. Feel free to contact us.